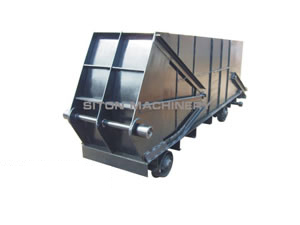 Founded in 1992, Siton machinery manufacturing Co., Ltd., is a professional mining skip manufacturer in China. The mining skip can be applied in all kinds of metallic and non-metallic mines, such as gold, solver, iron, lead, potash, coal and salt, etc. Designed for fast and clean dumping of ores, our mining skip is made up of aluminum or corrosion-resistant stainless steel. With a simple mechanical structure, the skip features high loading capacity and short unloading distance. The skip and roll-over stand can spin with the stationary axis. Flipping forward 45-55°, the skip begins to unload muck. Depending on their own weight, the skip and roll-over stand can come back to their normal tracks. Here in Sitonm, we supply a full range of mining equipment such as crawler drilling jumbo, hydraulic crawler drilling jumbo, single boom jumbo, etc. We have obtained the security certificate and the patent certificate of national grade. And our company possesses more than 60% market share for most of our mining machines. Our mining skips are well received in Canada, India, Kazakhstan, Vietnam, Morocco, Algeria, Laos, Nepal, etc. If you are interested in our mining skips, please contact us freely.